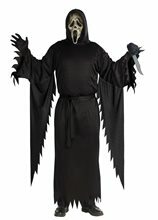 Saw Pig Deluxe Adult Men Costume;Based on the character from the Saw film series, the Halloween costume includes a deluxe long black trench coat with glossy red detailing and a pair of coordinating black patent gloves.The daunting outfit is completed by a realistic pig head mask featuring long black hair and jagged blood stained edging.The costume available in small & large size. 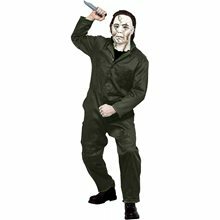 Deluxe Serial Killa Costume.Includes: One Jumpsuit and Mask.Available Size: Tween, Adult (Fits up to jacket size 40). *Shoes and Knife Not Included. "Serial Killa" Deceptions Disguise, Inc. This costume is new in its original package. 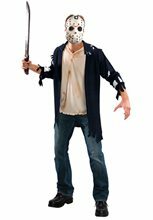 This costume makes a great Jason costume for Friday the 13th fans. 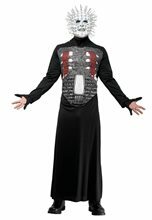 The costume is part of the Deceptions line produced by Disguise, Inc. 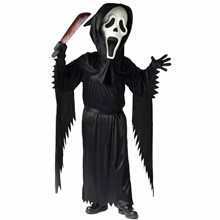 The adult costume is listed as fitting up to a jacket size 40. Keep in mind that packaged costumes tend to run slightly small in font so double check to make sure this costume is right for you.